In 2008 I had the crazy idea of walking in the New Orleans Marathon. I barely did any training, I was scared out of my mind (to the point where I almost backed out at the last second), but I attempted the 1/2 marathon and made it to 11 miles. Thanks to a giant blister on my right foot I was unable to finish the full 13 miles, but in my mind, it was a huge accomplishment. I got a crazy little (well, not so little) tattoo to celebrate the event and every time I look at it, it gives me a great sense of pride and reminds me that I need to get back out there again and finish the full 1/2 the next time around! My sister traveled with me and we wrapped a little vacation around it, which was a great time. My sister's soul mate city is New Orleans. She absolutely loves that town and everything that it has to offer. You mention NOLA (New Orleans, Louisiana) to her, and her eyes light up like a beacon in the night. She looks forward to traveling there as often as possible. I have to say, going to NOLA with my sister is like taking your own tour guide. She knows practically everything NOLA - neighborhoods, music, shopping, tours, off the beaten path interesting things to do, and my favorite, dining. She lived there for a time, made some wonderful friends and tries to get out there as often as she can. Additionally, she's a fan of New Orleans chefs, such as Emeril and John Besh (and I'm sure many others - maybe she'll comment on this post and tell us about a few more! ), and on this trip we made it a point to try a few places we'd never been to before. But then again, there are a few places that you MUST go to every time you're in town, such as Cafe du Monde for those lovely powdered sugar laden pillows of happiness otherwise known as Beignets. And the coffee. The coffee! The local coffee contains chicory, which gives their coffee a nutty smoky flavor that adds great richness. But you just don't go for the beignets, you go for the experience. It's an outdoor cafe, the dining area is in the heart of the French Quarter, facing Decatur street, which is hustling and bustling with shops, restaurants, live music and people that range from locals to travelers from all corners of the world. I'm a people watcher, so this is a great spot to do that. Oh and on a side note, just a small word of advice - when you eat beignets, as you bring that loveliness up to your face, don't exhale. Trust me. If you do, you will shower yourself and your travel mates with powdered sugar, and if you're wearing black, it's not a pretty sight. I speak from experience! And then there's Central Grocery, for the famous Muffaletta sandwich, (which they invented), which is laden with wonderful Italian meats, cheeses and a delicious marinated olive salad. It's so so bad but so so good. Other restaurants in NOLA have created their own spin on the sandwich, and I'd try them regardless, but we always make a stop at CG for the most authentic version. It's a must try! On one of our travel dates, we decided to have breakfast at Luke's, located in the Central Business District, which is owned by Chef John Besh (and my sister's mega chef crush). Besh prides himself on using local and sustainable ingredients, and I believe some of his menu items come right from his own farm! On the day we were there the restaurant was virtually empty, which was nice, but the service was making me laugh a bit because you could tell that the kids working there were not morning people. It is a party town, right? If I were in their shoes, I wouldn't be a morning person, either. 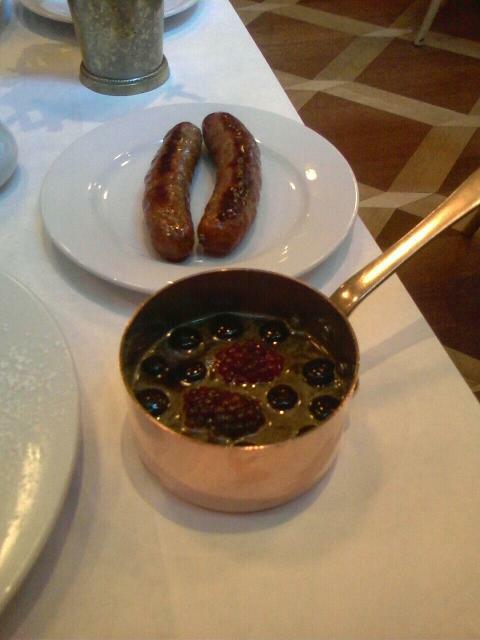 My breakfast also included warm maple syrup with an assortment of fresh berries, served in the cutest copper pot (I didn't have my big purse with me that day, otherwise they would have been short one small copper pot - I'm kidding!). I also ordered some sausage links on the side, which were chicken, if I recall correctly. Verdict? DELISH. 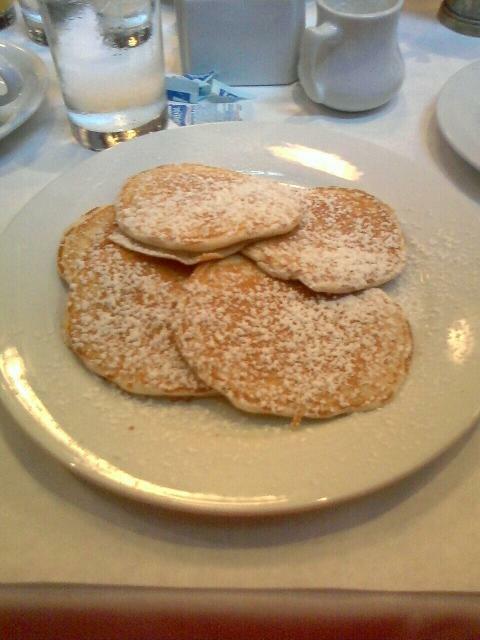 I'm not a big pancake eater, but when the mood strikes me, I gotta have 'em. And that was a great choice. The presentation was lovely and the food even lovelier. She also ordered the "home fries", which I think we expected it to be prepared in a hash brown style, but instead were presented with a cone of pomme frites! 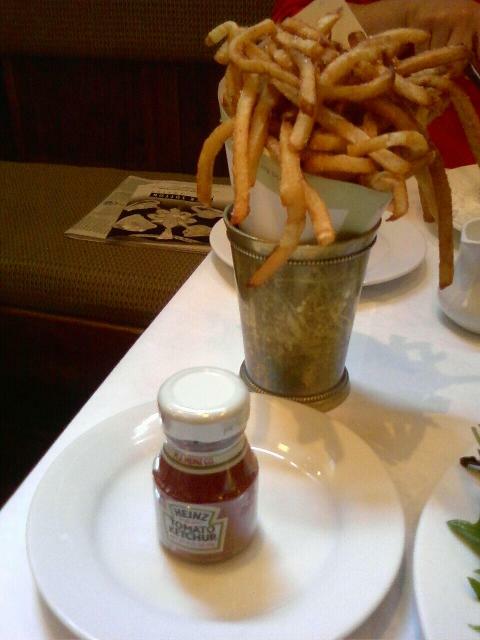 Every single one was crispy and well seasoned, which to me is important for any type of french fry (or pomme frite). We really enjoyed our breakfast and agreed we'd return on our next trip (Sis! It's been FOUR years, it's TIME!!!) 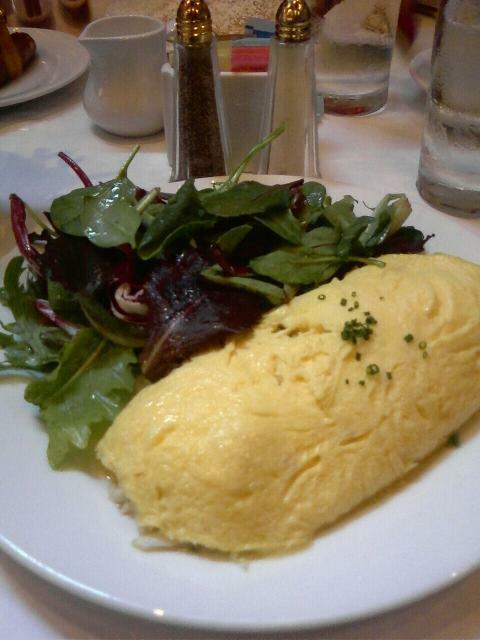 to try other items on the breakfast menu, or perhaps try their dinner menu. Can't wait! 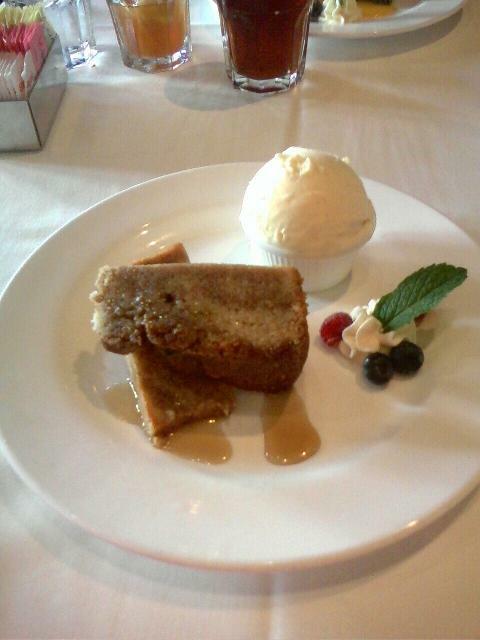 We also stopped for lunch the following day at Emeril's NOLA, located in the French Quarter. Going to that restaurant also reminds me of a funny and cool memory. My sister and I were oohing and aahing over the food, ambiance and when I started snapping pictures of my food, a lovely older woman sitting next to us and asked me, "Excuse me, are you a foodie?" I thought about it for a second, since that term was kind of new to me, and then I responded, "Why, yes, WE ARE!" The restaurant was beautiful, and I don't know why I didn't snap a lot of pictures of the restaurant, but I managed to snap a picture of my lunch, which was my first taste of shrimp and grits, and my dessert, which was Emeril's take on a root beer float. 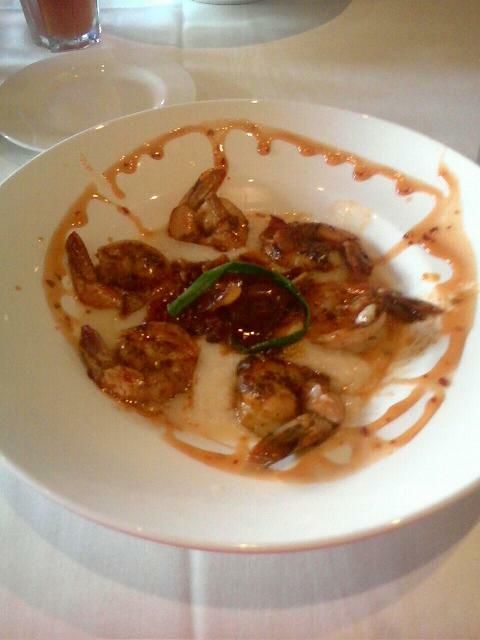 The shrimp were cooked perfectly, and the grits were creamy and delicious. I remember eating it and being concerned about it just tasting like bland cornmeal, and wow, was I wrong! It was seasoned well and the sauce gave it a really nice flavor. NOLA is a great restaurant - the location is in a fun spot, the decor is gorgeous and the service just as stellar as the food. I'll definitely return in the future! There are so many amazing restaurants in and around New Orleans, ranging from mom and pop shacks to elegant fine dining. I was early in my foodie-ness, so I didn't take as many pictures as I would have liked to at every place we stopped at. I promise to be better about it next time around!! As I type this, I've been hitting my expert with a series of questions confirming details and locations. She just sighed and said, "We need to go back to New Orleans." I was born there, but haven't been back in more than 10 years. 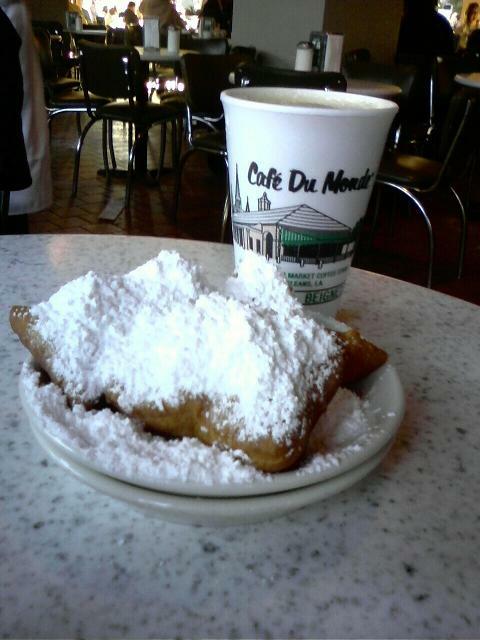 I'll be there this fall, though, and can't wait for my Cafe du Monde fix! Thanks for the other great recommendations, too!